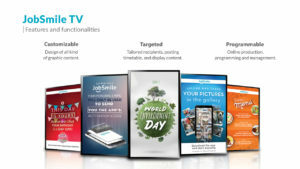 JobSmile TV is 100% customizable, so all the image, typography, logos and graphics consider the identity of your company, respecting even the smallest detail. Our platform will be the communication channel of your company, for that reason, our team will be dedicated to the development of your company’s content. All the contents of JobSmile TVfor your employees are developed by AYNOU and then published once the client gives his final approval. Are you ready to revolutionize Internal Communication?